The irony of Indian food is that dishes that are cooked on the days of religious fasts are often the tastiest (and at times the richest in flavour). 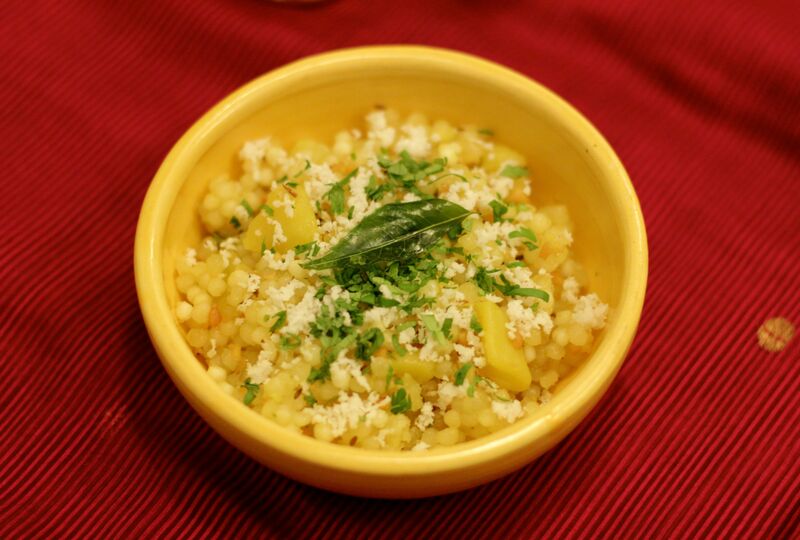 Sabudana khichadi is one such dish. My family never observed fasts, so sabudana khichadi would either get made for breakfast on weekends or as a tea time snack. It is made of sago tempered with spices. The sago is soaked in water for a few hours till it softens. Then it is wrapped in a tea towel to drain off all the excess water and cooked in ghee with cumin, green chilli, curry leaves, roasted peanut powder, salt and sugar. When serving It is topped with fresh coconut and chopped coriander. It looks light, but it is quite filling and very delicious! This entry was posted in Marathi cuisine and tagged sabudana khichadi, sago, snacks. Bookmark the permalink.